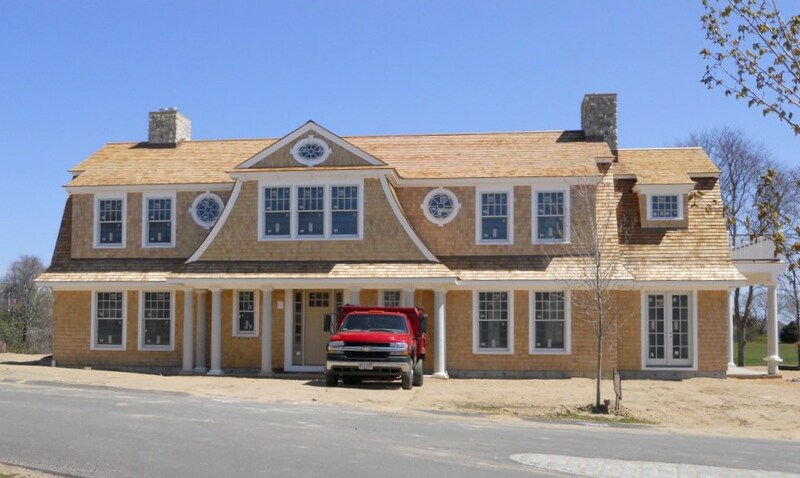 House on Cape Cod 4/29/12 | Joseph Bergin Architect P.C. Some months have passed since we last shared construction progress at the house next to the Chatham Bars Inn in Chatham, MA. Much progress has occurred since our last post about this project. All the framing and sheathing is complete, all the windows installed, the flashings, the trim, the roof shingles and siding shingles…all installed. It looks to the passer-by like a completed house! But there is still much happening on the interior. Mechanical, plumbing and electrical rough-ins are being completed, and once that work is finished, insulation will be installed, and then sheetrock will go up. So, in about a month or so from now, the interior finishing will be under way in earnest. That’s not to say there isn’t more progress to be achieved outside; for instance, the hardscaping (terraces, entry landings, etc.) that is to come in the months ahead will complement this house very nicely. Landscaping will provide verdant grounds ultimately, but for the next several months this house will have its feet in the sand. These photos were taken by the homeowners this past weekend. The Contractor had just finished installing the shingle siding in time for their site visit. As I touched on in an earlier post, shingle style “American Summer” architecture is the spirit of this seaside Cape Cod town. We are delighted with the outcome of the house at this point of completion and pleased that it will take its place this summer in the fabric of the community. Beautiful home, elegant proportions and materials. Tom, Thank you for you continued appreciation of our work! Lovely house that evokes all that houses on the Cape should. Nice job. What a magnificent structure! It combines all the best traditions of Palladian symmetry with English country elegance. Kudos to the architect, who clearly has not just designed a house, but crafted a home. Thank you Barry, your thoughtful observations are greatly encouraging to the architect! Cape House: Many times expensive houses are big but not gracious. This house has all of the charm and sophistication of prior ages as well as all of the amenities which we enjoy for contemporary living. Congratulations to the architect and the builder for creating a beautiful work of art. Fantastic! Love all the windows and the roof deck. What a view too! Can’t wait to see pics of the inside! Thank you Young for sharing your enthusiasm! Joe–what a beautiful home you are building! Its grace and proportion appear to fit perfectly into the idyllic setting. I am sure the homeowners cannot wait to enjoy! Thank you Michael! Happy to hear your sentiments…very much appreciated! Really beautiful house and property. This, to me, represents an extraordinary example of the classic shingle style “American Summer” architecture, often found on the Cape yet rarely perfected as in this superb structure. Congratulations to all involved with this project. Thank you so much William for such a wonderful and humbling tribute to this project! A truly magnificent home. Its grand exterior is only the beginning as I am sure the interior will be as thoughtfully crafted. Thank you Rich for your expression of confidence! In fact there is much trim and millwork planned for the interior and a highly skilled finish carpenter will be executing the work. The property and home are both stunning. The house looks grand while also warm and inviting. Will be a fantastic addition to the community and an amazing summer retreat for its owners. Cannot wait to see the finished product! Thank you Scott for sharing your thoughtful observations; I appreciate your comment and its sentiment very much… I too can hardly wait! Lovely home and great architectural detail (the widow’s walk is an excellent way to maximize the views). Am excited to see the interior progress. Thank you Henrik for your appreciation of detail…please visit again for progress updates on the interior…there will be much more detail to show! What is the square footage of this beautiful home? How many rooms? Hi Nancy – The house is 5,100 square feet. The layout is quite open, making the total number of rooms subject to interpretation. However, there are four bedrooms, including the master suite. Thank you for your interest!